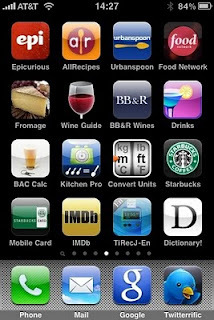 Chef's Notebook: There's an App for that! I have had my iPhone for a little over five months. In that time (contrary to my reluctantance to own one) I have found that I can do just about everything I need to do with one of the many applications ( or app's ) that are continualy being developed each day on the iPhone platform. Above is a actual screenshot of some of the app's that currently populate one of the pages on my iPhone. As you can see, some of them include a favorite subject of mine.... Food! I use at least one or two of the food related apps daily. From checking a recipe, to calculating measurements, it's a click away. So if you are planing a change in mobile phone platforms or are into food like me , then I would recomend the iPhone. And if you can think of a want, there's probably an app for that!